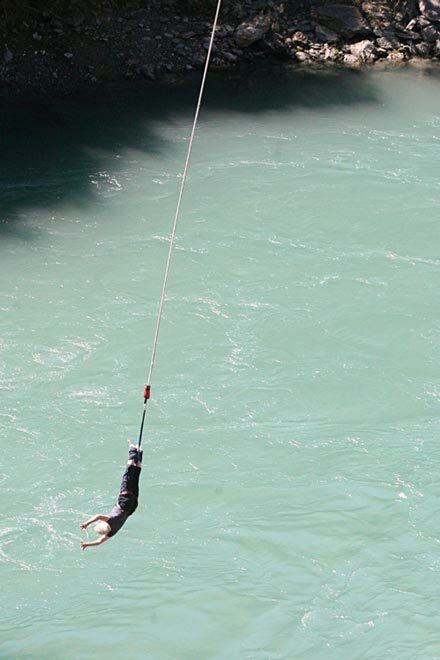 A bungy jumper hangs above the Kawarau River near Queenstown in 2008. In 1988 A. J. Hackett and business partner Henry van Asch pioneered commercial bungy jumping when they began operating at Kawarau Bridge. Subsequent growth in jet-boating, white-water rafting, paraponting, skiing, snowboarding and skydiving led to the coining of the term 'adventure tourism', and marketers were soon labelling Queenstown the 'adventure capital of the world'.